This is my personal drawing theory, and I am serious when I say that drawing is a skill and that it can be acquired by anyone who wants to learn it. Some of you may think that artistic ability is a God given talent and that not everyone has it. Let me take a stand here and say that there is nothing that cannot be learnt through practice. Don't believe me?! Keep reading! Let me explain drawing theory in a little more detail. Most of us want to achieve our goals in just one attempt. It doesn't matter if it's losing weight, quitting smoking or trying to draw a butterfly, it all takes constant and consistent effort to attain these goals. Isn't it true? Why is it so hard to accept that practice is needed to accomplish anything that we want to do? Your approach to drawing should be no different. We all walked before we learned to run. If we want to draw, and draw well, there are certain challenges that we have to face. In the beginning of the drawing process, make yourself realize that what you are actually doing is practicing. It is a necessary part of training and the goal at this stage is not to create a master-piece, but rather to make something that is better than your last attempt. With that said, always remember to do your best, but don't set unrealistic goals for yourself or you will become frustrated and want to give up. What I'm trying to say about my personal drawing theory and approach to drawing, is that if you are just starting out - don't beat yourself up. Things will get better over time; trust me. Another important part of my drawing theory is to remember that drawing is not always about realistic representations. If that statement is false, then what is photography for? I will agree that if you are able to make something look similar to its original, it shows that you have great perception skills and pencil control. However, believe me that it is not necessarily the best form of communication; it is just one style of drawing among many. I will however, not deny the fact that drawing realism and accurately capturing what you truly see is the starting point for any serious artist. So, begin by learning to see the subject and control your pencil. Always remember, that when drawing something, the function of your eyes is more crucial than what your hand does on the paper with the pencil. Believe me; once you learn to break the object you see into lines, curves and angles, you can draw anything. It may help to write the old saying, "Practice makes perfect" and tape it somewhere that you will see and constantly be reminded that your drawing skill will improve with the time and effort that you put into it. Many of us believe that it is necessary to draw from imagination to be an artist. This is one of the myths that can discourage people from drawing. Undoubtedly, some people have a good memory and they do not need to look at the subject in order to create a beautiful drawing. The reality however, is that the people who are able to seemingly create beautiful drawings out of thin air have been practicing for a long, long time and it's really unfair to compare a beginner with someone like this. The old saying, 'Practice makes perfect' is one of the keys to my drawing theory. Like any other skill worth acquiring, drawing also requires practice and determination. Why do you expect yourself to make an amazing drawing on your very first attempt? Masters often draw their subjects several times before they actually begin to make their final drawing. If you can't see the logic in this, then draw the same subject five times and pick out the differences and draw it five more times to see what you come up with. I think you will begin to understand my drawing theory a little better once you have completed this exercise. Every time you draw the same thing it is a little different. I can not say if each drawing will be better or worse, only that they will be different and that it is up to the artist to choose which of these drawings he or she thinks is best. Chances are, that your first drawing will almost never be the 'best' one of the several you create in an exercise like this. One last note on drawing theory: you will never have a good result if you are drawing under pressure. Make yourself comfortable and begin your learning process right now. 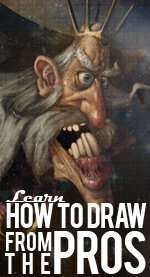 With a little hard work, determination and help from your friendly neighborhood drawing coach you will begin to see the difference in your drawings in no time.